Look at the big listing of experienced producers, providers and exporters of different metals, minerals and metal items. The firms listed here are well-known in the market for the quality and price of items they offer. The top quality items offered by them can be completely used for different functions in different sectors. 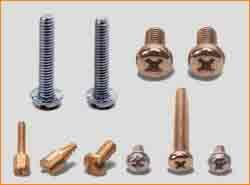 The producers, providers and exporters of metal and metal items here completely meet the different requirements of customers and production sectors. You can get a variety of metals like stainless steel, metal, copper mineral etc. All the Minerals & Metal Goods are classified consistently for straightforward surfing around and a quick look for. Here, you can Buy and Sell a variety of General Minerals and Metals. Buyers can Post Need for Commercial Minerals and Metal Products and directly send Business Enquiry to a large number of Metal Products Manufacturers and Suppliers globally. B2B Suppliers can list their organisations on this page, Advertise Minerals & Metal Products, promote Trade Offers and generate Business Leads. To find quite a number of minerals & metals online, go through the great catalogue on Corpiness. A well-designed b2b marketplace, it details the details of a large number of minerals & metals producers, exporters, providers and merchants together with their complete business information and presented promotions & services. These minerals and metals are appropriate in many areas which are valuable for every sector relevant works. Corpiness having a Business listing which has its importance as through this the customers is not required to look for so much for every relevant subject instead of this everything is available with just one click. Featured Products in " Mineral & Metals "